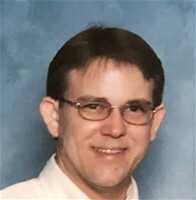 Billy Wayne Knight, 52 of Elizabethtown, entered into his eternal home with his Lord, Jesus Christ while surrounded by his loving family on March 27, 2019. He was born on June 18, 1966 in Tachikawa, Japan. Billy is survived by his wife, Marlene Knight; his three children, Brittany Smith (Travis), Katie Johnson (Jeff), and Jacob Knight; his parents, Eddie and Ann Knight; his brother, Jimmy Knight (Stacey); and five grandchildren, Casey Smith, Tucker Smith, Brentley Smith, Elliott Smith, and Asher Johnson. Billy worked for CSX railroad for 25 years as a Communications Specialist and enjoyed going to work daily with his dear friends. He took great pride for his family and deeply loved his wife of 30 years, Marlene, and his children and grandchildren. He enjoyed teaching them about responsibility and the love of God. Billy was an avid University of Kentucky basketball fan and when he was able, he enjoyed being outdoors or attending his grandkid's sports events. His favorite Bible verse was Revelations 22:1-2. Expressions of sympathy can be made to St. Jude Children's Hospital or Kosair Charities in his honor. The funeral will be at 1 p.m. Tuesday at Brown Funeral Home with Todd Edlin officiating. Burial will follow in Hardin Memorial Park. Visitation will begin at 10 a.m. Tuesday at the funeral home. Condolences may be expressed online at www.brownfuneral.com.